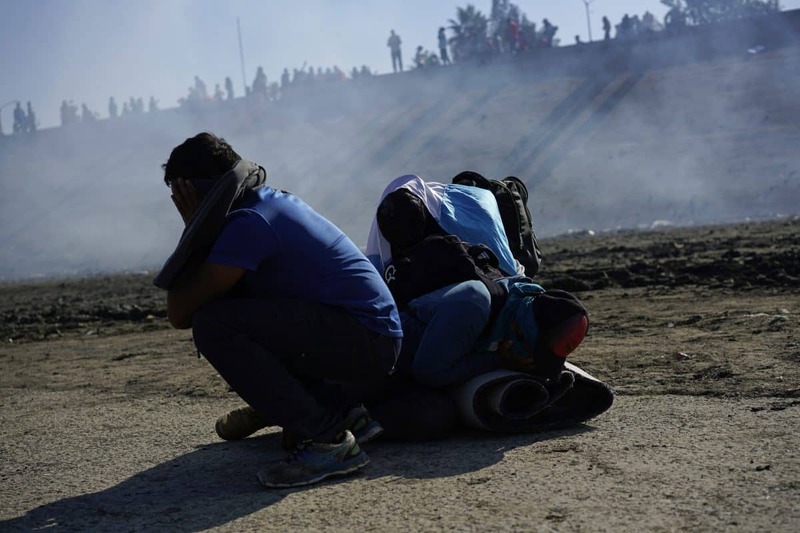 A rally is scheduled to take place Thursday at Harvey Milk Promenade Park in support of Central American migrants in Tijuana following reports of U.S. border patrol agents throwing tear gas at a crowd during a clash over the weekend. The rally is being organized by the Long Beach Immigrant Rights Coalition, whose members were in San Diego over Thanksgiving weekend to donate clothes for the migrants and later to take part in a scheduled march meant to bring awareness to their plight. Coalition member Gaby Hernandez said she took part in that Sunday morning march on the U.S. side—at a park in the San Ysidro district of San Diego, less than a mile away from the border. While Hernandez and hundreds of other supporters of the Central American migrants marched to the border from Larsen Field, she said there were police helicopters following the crowd. “Obviously there was tension because of having police presence,” Hernandez said. “I was a little thrown off by the helicopters”. At the same time as Hernandez and others marched toward the border, so did hundreds of supporters on the other side in Tijuana. Hernandez said border patrol agents threw tear gas an hour after she left. U.S. Customs and Border Protection Commissioner Kevin McAleenan said hundreds — perhaps more than 1,000 — people attempted to rush vehicle lanes at the San Ysidro crossing. Mexican authorities estimated the crowd at 500. The chaos followed what began as a peaceful march to appeal for the U.S. to speed processing of asylum claims. U.S. authorities made 69 arrests on Sunday. Mexican authorities said 39 people were arrested in Mexico. Mexico’s National Migration Institute said that 98 migrants were being deported after they tried to breach the U.S. border. Hernandez said Thursday’s rally is meant to raise awareness against the injustices shown to the migrants and the human rights violations done against them. Second District Councilwoman Jeannine Pearce and a representative of Congressman Alan Lowenthal are scheduled to speak. Organizers will also be accepting more donations with coalition members planning on dropping them off in Tijuana later in the week. Canned food, prepaid phones, international calling cards, hygiene products and jackets are some of the donation items that organizers are hoping to receive. Community members unable to attend Thursday’s rally but wishing to donate can do so by dropping off items at the Long Beach Interfaith Community Organization office in North Long Beach at 5600 Linden Ave. Monetary donations can also be made on GoFundMe here, to Share The Journey San Diego here or the San Diego Rapid Response Network here. For more information on the rally and requested donations click here. The event will take place 6 to 7 p.m. Harvey Milk Promenade Park is located at 212 E. 3rd St.